Whether your styling vision is modern luxe, industrial, or earthy and organic, your wedding tables and chairs are a great way to help you bring this to life. If you’re currently planning a sit-down wedding reception, keep reading for a complete guide on the different table and chair hire options we have available, along with our top styling tips and inspiration for each one! Let’s talk first about your wedding dining tables. We’ve come a long way since plastic trestles - these days, your wedding tables can become a statement piece in themselves. 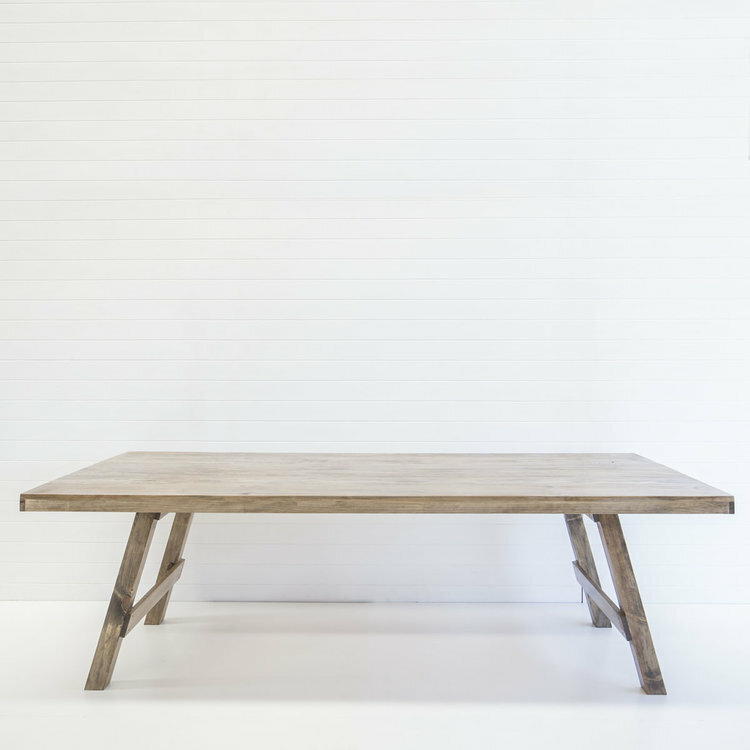 Here at HEH, we have 3 dining table options: our long wooden dining tables, timber feasting tables, and black timber feasting tables. So which one is the best option for you? The first thing you’ll want to consider is the logistics of your dinner service. Are you planning a feasting-style menu, or alternate drop/buffet? 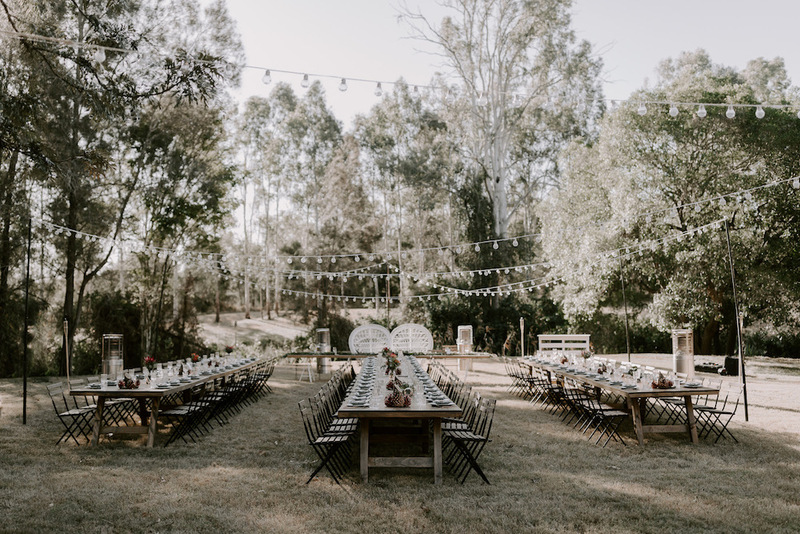 Our feasting tables (at 1.1m wide) and black feasting tables (1m wide) are best suited for couples opting for a shared menu and needing a little extra space for tableware and food service, while our long wooden dining tables (86cm wide) can accommodate either alternate drop or buffets. Read all about our top tips for figuring out your table layouts here! Once the logistics have been considered, you’ll then want to think about the overall look and feel you want to create, as your dining tables will become the foundation for this. When it comes to styling, our timber table options are perfect for a natural, earthy and organic look, and work well with pretty much any colour scheme or chair style. They are incredibly versatile, and can be dressed up or down to provide either a relaxed or modern setting. 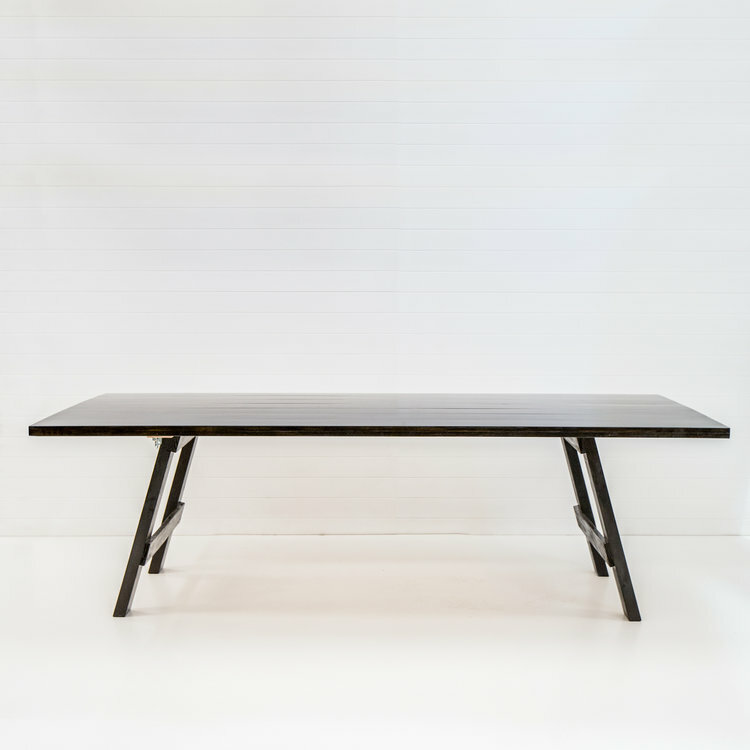 Our black feasting tables work perfectly for a more polished, sleek and sophisticated look. 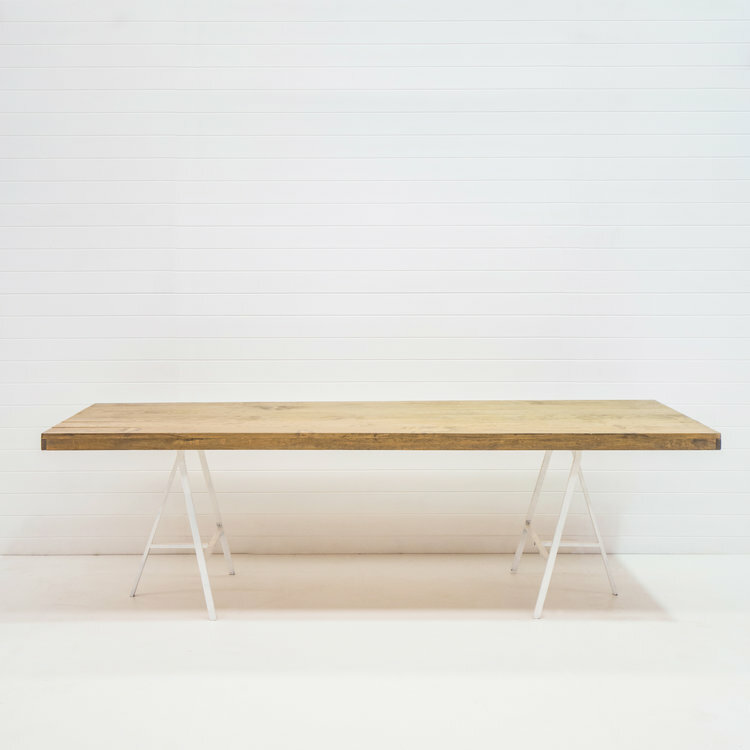 If you really want your dining tables to make a statement, this could be a great fit for you! Our black dining tables can be styled with neutral tones for a monochromatic look, or contrasted with bold pops of colour and luxe metallics. We think these tables work best with a black, white or gold chair style. Our new Indie dining chairs are designed with a woven rattan seat and curved metal legs. These beautiful chairs are ideal for a unique point of difference, and help to add depth and detail into your table styling with their textural appearance. With two colour options available, our natural Indie dining chairs work well for a modern, boho-inspired reception and can help to “lighten up” a space, while our black Indie dining chairs create a more refined and contemporary look. Our Soho wire dining chairs in white and gold would have to be our most luxurious chair style, with a streamlined wire frame creating a modern, clean and polished feel. We think these chairs look stunning in clear marquees, light-filled halls and industrial spaces. This elegant wire design pairs perfectly with luxury tableware (think gold cutlery, crystal glassware and statement crockery) to create a high-end, glamorous vibe and instantly elevate your styling! Our oak cross back chairs have quickly become a favourite with our clients, and are best for creating a relaxed yet elegant feel for your reception styling. The classic cross-back design is perfectly suited for earthy settings, in a versatile shade of timber to complement pretty much any colour scheme. We love these chairs paired with our timber feasting tables for a seamless look, and styled with lots of textural foliage, pastel tones and elegant table details. Our European bentwood chairs are a timeless chair option if you’re wanting to create a romantic, classic look - these beauties simply never go out of style! With a curved back and embossed seat, our bentwoods are available in white, walnut and black to suit your desired look. Our white bentwoods are perfect for a fresh, romantic feel, our walnut bentwoods work perfectly for an earthy bohemian look, while our black bentwoods will give you a modern, sophisticated or even industrial vibe. Our Tiffany chairs are ideal for a simple yet elegant look. Just like our bentwoods, these timber chairs come in both white and walnut to suit your styling concept. We think these dining chairs work well with our long wooden dining tables, or even paired with floor-length linens for a timeless setting! Our Tiffany chairs pair well with statement tableware and clean, refined styling. Our timber bench seats are perfect for a more low-key and informal wedding reception. Timber bench seats will give you a relaxed, picnic-style feel, and work great for Tipi or outdoor weddings. For a truly unique look, you can also go half-half with another chair style, like our bentwoods. Complete your setting with some eclectic tableware to tie it all in together! Our French bistro chairs are our most casual chair style, and work well for relaxed, rustic receptions. These timber chairs look great in garden settings or barn-style venues, and can be customised with a padded seat cushion for extra comfort. We love these chairs paired with earthy colours, native flowers and scattered candles! No matter what dining table and chair combination you choose, we recommend securing them early as they do book out quickly. Check out our furniture hire timeline for our tips on when to consider hiring furniture for your wedding. Want a copy of our latest hire catalogue for more furniture and decor inspiration? Get in touch right here to get the ball rolling for your event, or find more styling ideas and planning tips in our latest blogs below.